... used worldwide for 20 years. The measuring frame and all accessories can be safely stored within the massive carrying cases. Due to latest technology, the evaluation unit is small, handy, unbeatably easy and comfortable to use. The World’s Leading Trade Fair for Construction Machinery, Building Material Machines, Mining Machines, Construction Vehicles and Construction Equipment bauma 2019 is taking place in Munich April 8–14, 2019. Of course, we will present our testers. But even more important for us is to meet you in person. So please save the date and let us know if you are planning to visit the bauma.We would like to invite and to send you your personal voucher. can not be packed into wrapping paper - love, family, friends, laughter, health, happiness. This year we celebrated cosy ″Scandinavian Christmas″ within the historic walls of the ″Festung Mark″ in Magdeburg, with delicious Glögg at fire, feast, music, dance and crappy Secret Santa! We wish you also such comfortable hours! As a medium-sized family business, we are aware of the responsibility for our region! We take the opportunity to actively help designing our future. Today we invest in future talent. We support personally and financially the ″Fest der kleinen Forscher und Forscherinnen″ (explanation: festival for little researchers) of the Familienhaus Magdeburg. The aim is to get children enthusiastic about experimentation and natural science / technology. This contains numerous hand-on activities. Admission to this festival is free of charge, so that every child can participate, if it wants to. You would like to do something good? Here you can find information about Familienhaus Magdeburg gGmbH. Our HMP Christmas trees are shining again! They put us into the mood for the wonderful Christmas season and warmly welcome you in both company buildings. This year, they were decorated by Sarah Posdorfer, our new colleague, who joines our in-house team since the beginning of November. The whole HMP team wishes you a merry and reflective pre-christmas season! Our new, detailed video for the Static Plate Load Test by using the HMP PDGpro is online. You can find it here and of course on our Youtube channel. In Magdeburg public transport is being expanded. In addition to the large construction site "Damaschkeplatz" near the main railway station, a completely new tram route is being built in the north of the town. On behalf of MVB Magdeburger Verkehrsbetriebe GmbH & Co. KG, STRABAG has already begun with the excavation works at the centre section of this route. Dynamic plate load tests by means of the Light Weight Deflectometer HMP LFG support the speedy construction progress combined with simultaneous quality assurance due to the fast, reliable proof of the compaction quality and load bearing capacity of the soil. The new tram route connects 10,000 inhabitants of the district Neustädter Feld with the town center. Since the tram route will be continuously built on a particular roadbed, the trams can travel largely independent of other traffic and thereby allow a rapid, same-tram trip to the town center. Punctually at 9 am, the organizer Röhrenwerk Kupferdreh Carl Hamm GmbH opened the doors for its trade fair. Our managing director Mr. Gunnar Hennings and our sales manager Mr. Stefan Kanter are looking forward to have a personal conversation with you and our business partners, who are also exhibiting there. They will be happy to provide you with comprehensive information about our test equipment, such as the Light Weight Deflectometer HMP LFG, the Static Plate Load Tester HMP PDG, the soil density meter or the electronic evaluation unit for dynamic probing. Free access! Catering is provided. Enjoy the food at the barbecue stand. HMP test equipment is in use in 124 countries! After dispatching static and dynamic plate load tester from Magdeburg to the whole of Germany and also to Norway, Great Britain, Poland, Russia, Slovenia, Lithuania, Thailand, Latvia, India and to the USA during the last few days, we wanted to know it exactly and have counted. Currently our test devices are in use in 124 countries! Light Weight Deflectometer HMP LFG are also used during construction of the high-speed rail line Thailand-China! The mammoth project is divided into three phases. The first construction phase, the 250 km section between Bangkok and Nakhon Ratchasima in the northeast of Thailand, has already begun. In just 20 years, this high-speed rail line is supposed to connect southern China via Laos with Thailand. The “Ferry-free coastal highway route E39” project entails the creation of several long tunnels along the southern Norwegian coast. The tunnelling operations will generate a tremendous quantity of blasted rocks. These could be used in the road unbound layers close to the place of production to provide a sustainable cost-benefit application. Two different non-traditional additive types are examined to improve the properties of weak rocks: one is polymer-based, the other one is lignin-based. A current investigation is assessing the additives’ performances in a full-size field test situated close to Trondheim, Norway. The Light Weight Deflecttometer HMP LFG is being used to assess the development of dynamic modulus and deformation over time. Quite a few static and dynamic plate load tester from HMP are already being used to expand the infrastructure in Azerbaijan. Today, another 2 static and 3 dynamic plate load tester as well as 2 lightweight penetrometer are starting their journey. These were ordered by our Turkish distribution partner. For the Azerbaijani Ministry of Transport, the construction and reconstruction of all important transport routes in the country has top priority, explained the transport minister Ziya Mammadov. In the last ten years in Azerbaijan were built and reconstructed approximately 8,332 kilometers of motorways, about 222 new bridges and road connections. The Silk Road Corridor is of great importance for Azerbaijan and many other countries. The construction and repair works are currently being carried out on the 513 kilometer long section of the internationally important motorway that runs through Azerbaijan. In order to accelerate the construction projects and to ensure their quality, German test methods are increasingly being used such as the static and dynamic plate load test by means of the HMP PDG and HMP LFG. Together with our long-term Lithuanian partner UAB "Elremta Mastermann" we presented our latest test equipment for soil mechanics. Also on construction sites sun does not always shine and so despite grey sky the knowledgeable audience was very interested even on the outside area of the RESTA2018. The largest international construction exhibition of the Baltic States also attracted experts of the construction industry from the surrounding countries. Our sales manager Mr. Kanter also welcomed visitors from Latvia and Estonia, which were particularly interested in application and handling of the Light Weight Deflectometer HMP LFG. Today 4 Static Plate Load Tester were re-ordered by our Algerian partner - this time for a large Chinese construction company. Since 2007, the largest African road construction project is being carried out in North Africa. The more than 3,200 km long "Autoroute Transmaghrébine" connects the three Maghreb countries Morocco, Algeria and Tunisia as well as Libya. Along the North African "lifeline" are 55 cities with a population of more than 50 million inhabitants, 22 international airports, the largest ports, railway stations, universities, hospitals as well as the most important industrial- and tourist areas. Even planned are tunnel through the Gibraltar Strait between Morocco and Spain, in order to create a connection to Europe. Therefore, an intense traffic on the motorway is being expected. To meet this demand, particular attention is given to the bearing capacity of the soil. By means of the Light Weight Deflectometer HMP LFG and the Static Plate Load Tester HMP PDG the compaction works are specifically monitored to increase the quality of the construction work. Together with our longtime Lithuanian partner UAB "Elremta Mastermann" we are presenting our latest test equipment for soil mechanics. Location: Lithuanian Exhibition and Congress Centre "Litexpo", Laisvės ave. 5, Vilnius. RESTA is the largest international construction exhibition in the Baltic States aimed at construction industry professionals and end-users interested in construction and renovation. Every year, RESTA introduces digital solutions and innovations, latest building materials and equipment, as well as landscaping trends.RESTA turns 25! The first RESTA was held back in 1994. Today, RESTA is one of the most successful and oldest events organized by the Lithuanian Exhibition and Congress Centre LITEXPO. Recently, there have been over 500 companies from Lithuania and many European states taking part in the Exhibition every year. In January the African Development Bank declared Ghana one of the fastest growing national economies of the continent. The growth rate currently stands at 8.5 percent. In connection with the extended gas- and oil production, the Ghanaian export trade and also the domestic electricity supply increased significantly. Especially, the infrastructure and the education sector of this country benefit from reduction of national debt, since more money is available for road construction and schools. President Nana Akufo-Addo emphasized that the government will furthermore fight against corruption and strive for a sustainable budget plan, so that his country can dissociate from further rescue packages of the International Monetary Fund.We keep our fingers crossed and are proud that our test equipment contributes to quality assurance in the road- and railway construction in Ghana. Today we dispatched another HMP PDGpro to Managua! Currently, for instance, works are going on at the Costanera or Ruta Turística del Pacifico motorway, which was commissioned by the Ministry of Transport and Infrastructure (MTI) at the beginning of 2017. It runs between the departments Managua, Carazo and Rivas, so parallel to the South Pacific coast of Nicaragua, and shall facilitate the ways to the main tourist areas. Giving joy is the real gift. Today, a small delegation of parents, children and caregivers of the ″Rolandmühle″ surprised us with a gift - pictures from their trip to the zoo in Magdeburg! During winter holidays, the families were surprised by their caregivers with a trip to the zoo in Magdeburg. Here they were especially able to enjoy some family time together - completely relaxed, without the everyday concerns. From the HMP Christmas voucher there is still enough left to go to the Elbauenpark in Magdeburg in June to the big Children′s Day party. Everyone is already looking forward to it! Do you also want to support them? Here you can find information about projects of the ″Rolandmühle″. Also in Bolivia, Potosí, static plate pressure tests are being carried out with the HMP PDGpro to determine the deformation / load capacity of soils. Our HMP Christmas trees shine again! They prepare ourselves in both company buildings for the approaching holiday season. This year, they were decorated by Kirstin Wild, our head secretary. You will hear her friendly voice when you call our hotline +49 391 2514666. The whole HMP team wishes you a happy and peaceful Christmas! We wish you many enjoyable hours! HMP PDGpro - new video in production! Our new, detailed video for the Static Plate Load Test by using the HMP PDGpro is in progress. You will find it here soon and of course on our Youtube channel. The "X CONGRESSO MEXICANO DEL ASFALTO - EXPOASFALTO" 2017 took place from 23rd to 25th August 2017 in Cancun, Mexico. The event is organized every two years by the AMAAC - Mexican Association of Asphalt. The AMAAC has set itself the goal of improving the quality and competitiveness of products, processes and services related to asphalt, as well as supporting research and technological development by means of specialized trainings and technical publications. All important for the quality of a road is, however, not only the quality of the surface but also the quality of the bearing layers beneath. That´s why the booth of our Mexican sales partner, where the static and dynamic plate load test by means of the HMP test equipment HMP PDG and HMP LFG was demonstrated, aroused brisk interest amongst the experts. Now even faster through Copenhagen! The Static Plate Load Tester HMP PDGpro is currently being used in track construction in Copenhagen. The company "DMR Geotechnik" relies on precise testing technology from Magdeburg! In the first three construction phases, among other things the airport and the city development area Ørestad on the island Amager were connected to the city centre of Copenhagen. By means of this city ring the accessibility of the city centre by public transport shall now be increased. "Building calls for testing." This also applies in the faraway Paraguay. We just received the message from a local geotechnical engineer, that his Light Weight Deflectometer HMP LFG4 has landed well. He and his colleagues were already eagerly waiting and now look forward to the usage of the tester. In 2013, the government of Paraguay started a road improvement and development project, including the construction of a new six-lane highway in the capital city Asunción with connections to the local transport network and also with a connection to the coastal road (still under construction), which toghether form a ring around the city to relieve the traffic there. Also in this case, the dynamic plate load tester from Magdeburg is used for quality assurance. Unfortunately, in the past, it was hardly possible for the Magdeburger Tafel to maintain the cold chain for donated foodstuff. Many donations could therefore not be picked up. But now this is history because of the new refrigerated vehicle! On July 11, 2017, the new refrigerated vehicle for the Magdeburger Tafel was officially launched. HMP and other Magdeburger sponsors have made this possible through their support. The 23rd AUTOSTRADA-POLSKA, International Fair for Road Construction takes place from 09. to 11. May 2017 in the central Polish city Kielce. It is the leading exhibition in this Polish branch and of central importance for trade relations with Central- & Eastern Europe. Together with our Polish partner GEOLAB., with whom we have been cooperating successfully for almost 20 years - now in second generation - we are presenting our latest test equipment for soil mechanics. GEOLAB is the leading supplier of geotechnical and soil testing equipment in Poland and also delivers a wide range of laboratory test equipment for aggregates, asphalt, bitumen and concrete. Paweł Szkurłat and his colleagues support and advise our Polish users of the Light Weight Deflectometer HMP LFG and play a significant role to the fact that the dynamic plate load test is becoming more and more popular as a fast and cost-effective test method for quality assurance at Polish construction sites. "The AURA prize is an acknowledgement for the global business activities of the distinguished companies", emphasised Economic Secretary Thomas Wünsch on March, 30, 2017 during the Foreign Trade Day of Saxony-Anhalt. With "AURA" - the "award for outstanding business activities in Saxony-Anhalt", the Ministry for Economic Affairs, Science and Digitalization honors companies, who take new paths, think lateral, question the established, develop innovative products and successfully launch them on the market - in short: companies with an impact on the economy in Saxony-Anhalt. We would like to thank the Chamber of Engineers of Saxony-Anhalt for the nomination and its vice president, Mr. Harald Rupprecht, for laudation at the prize award ceremony. Our special thanks go to our customers and partners worldwide, who support us every day by their trusting cooperation! Again and again, communities need to repair brokenup road surfaces, eliminate the consequences of water pipe leakages and carry out the necessary roadway renovations. In case that this is a classified roads, in other words a roadway for which maintenance the federal state or province is in general responsible, the responsible supervisor requires a professional proof regarding proper compaction of the filled up area or rather proper restoration of the road surface. Until now in communities it was only allowed to be done by specialized companies, because they have to have special test equipment. This increased the costs, especially because the construction works could normally not be carried out self-operated by the building yard, but also a subcontracting was necessary. By means of their own dynamic plate load tester, decisions and proofs for construction works can now be made even faster and cheaper. In December 2016, the recertification of HMP as a calibration institute for the Light Weight Deflectometer according to TP BF-StB was carried out by employees of the Federal Highway Research Institute with further approval until 2021! Only a few weeks remain until Christmas! Also at the Magdeburger Tafel the preparations for the large Christmas party are running at full blast. The HMP Magdeburger Prüfgerätebau GmbH also participates again this year and will finance the gifts for 150 children. Therefore, a cheque of 2,200 € was symbolically handed over to the AQB. "We build test equipment for soil mechanics, which are deployed worldwide. As a medium-sized family business, however, we are deeply rooted with Magdeburg for almost 30 years. We are delighted that the success of our company enables us to support the tireless work of the Tafel employees and to fulfil the children of the Magdeburger Tafel a Christmas wish." Gunnar Hennings, MD of the HMP Magdeburger Prüfgerätebau GmbH. During an official ceremony in the city hall, selected companies from Magdeburg were honored on November, 3, 2016 for their effective development and successful company succession. Chief mayor Dr. Lutz Trümper presented the award to company founder of the HMP GmbH Klaus Hennings and its successor Gunnar Hennings. West Africa - On behalf of the German Federal Armed Forces, which is currently located in Mali as part of a UN peace-keeping operation, the Static Plate Load Tester HMP PDG is used for assessing the deformability and bearing capacity of soils in road construction. For substructure they traditionally use laterite. Laterite is a frequently occurring surface product, which results from intensive and long-lasting weathering of the underlying rocks. In the capital of Somaliland, the northern part of Somalia, live more than 500,000 people. In order to supply the growing population with sufficient drinking water, they are currently working intensively on the expansion of pipes for modernisation of the municipal water supply. Easy handling and quick procedure, even under very confined site conditions, inspire users here. The municipal water authority saves huge costs by using the Light Weight Deflectometer, because construction progress accelerates, but also subsequent settlement damages will be avoided. Whereas the Light Weight Deflectometer HMP LFG is used for quality assurance in railway-, road-, canal- and soil construction already in North-, East- and South Africa, now also in Westafrica they are involved in this fast and non-destructive test method in order to determine the compaction or bearing capacity of soils and base layers - the dynamic plate load test. At the moment our local partners in Dakar test the handling of the HMP LFG in a road examination laboratory and familiarize themselves with the simple and quick operation. The robust construction and the therefore used resistant materials protect the tester optimally from dust, dirt and heat. In the laboratory and also directly on constructions sites correlations to existing test methods are now being determined in order to save time and money in quality assurance by means of this new method and also to improve the construction works and to make it more transparent. According to the motto „Where The Roads Meet” the this year‘s Roads, Bridges and Tunnels Fair took place in Ankara. This motto has also a symbolic value - because Turkey lies on the corridor, connecting Europe and Asia and in Ankara, the capital, many streets come together. Our sales manager Mr. Kanter presented together with our long-term partner UTEST the Light Weight Deflectometer HMP LFGpro and its flexible application possibilities. The interest was huge, nevertheless, the dynamic plate load test is a fast, precise and also cost-effective alternative to traditional methods for determination of compaction or bearing capacity of soils. Record attendance at the HMP booth!. Our expert team was delighted about the enormous interest of the trade visitors in the reliable test equipment for soil mechanics from the HMP family, but of course, particularly in the new HMP LFGpro. The new device version of the Light Weight Deflectometer was presented for the first time at the bauma 2016. By means of the HMPtransfer App the measurement results can be forwarded directly from site to office for further processing with web-based evaluation software HMPreport! Bluetooth, USB, GPS and the large illuminated display make measurement and evaluation simple, comfortable and fast. You were not able to visit the bauma 2016? No problem, we are pleased to send you the new brochure including detailed information about the dynamic plate load test by means of the new Light Weight Deflectometer HMP LFGpro. Visit us at the bauma 2016! From 11th-17th of April 2016 the world’s leading exhibition for construction machinery, building material machinery, mining machines, construction vehicles and construction equipment will be held in Munich for the 31st time. Discover the trends of tomorrow! Share your experiences with our experts. Convince yourself about the functionality of our testers and discover our new developments in the field of soil-mechanical test equipment directly at our booth. Test it under realistic conditions and be surprised by its innovative features! We would be pleased to welcome you. On demand we will send you your personal voucher. We are looking forward talking to you. Our HMP Christmas tree again shines in our entrance area this year and gives us a taste of the peaceful Christmas season. This year it was decorated by Lisa Rothenberg, our new colleague from the marketing and sales department. The whole HMP team wishes you a merry and peaceful Christmas time! Magdeburger children discover their town with HMP! This week the first group of children of the Magdeburger Tafel went on an exciting discovery tour in the red double-decker bus through their hometown. Many of them only knew so far their house blocks. We on the other hand travel all over the world. But are still closely linked to our home town and region. That′s why we are of course committed to social projects, among other things, we support the Magdeburger Tafel. where they got to know better Magdeburg. If you are now also interested in discovering Magdeburg, here you can find more information or you can just give us a call. Now it′s for sure – children of the Magdeburger Tafel can look forward to a wonderful Christmas celebration. Today we handed over a cheque for 3500€ to the AQB gGmbH, carrier of the Magdeburger Tafel. Now the Managing Director of AQB Mrs. Rießler, Mr. Rosin and their committed staff can implement a miraculousness Christmas party for 150 needy children and their parents. More information regarding Magdeburger Tafel can be found here. 25 years HMP - great anniversary celebration! 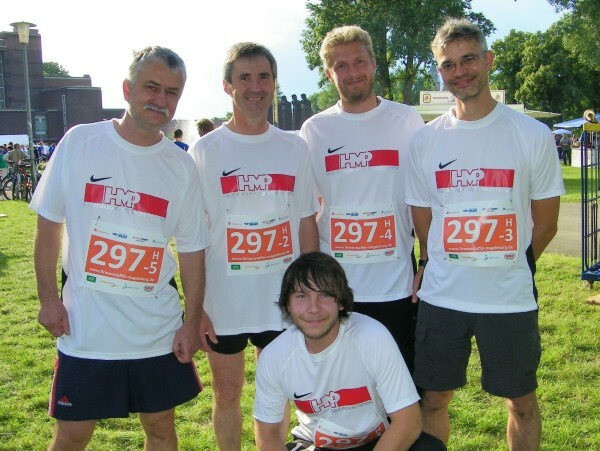 On the 24th of July 2015 more than 150 guests followed our invitation and celebrated with us ″25 years HMP″ in the gorgeous scenery of Fort Mark in Magdeburg! Among representatives from politics and business, such as the deputy mayor of the state capital Magdeburg Mr. Rainer Nitsche, the chamber of commerce vice president Dr. Jürgen Ude, long-standing partners and customers from Germany and abroad, of course the complete HMP team, family and friends - what a party! Everybody who got access by the Fort′s commander could spent a wonderful evening. The inspiring speech of company founder Klaus Hennings, the speech of his son and successor Gunnar Hennings and the surprise organized by the HMP team impressed us all very much. After an irresistible dinner the fort′s commander guided all interested guests through the historical building, a lift platform allowed to enjoy a view about Magdeburg in 40m height, a lightning sketcher portrayed the guests and the gigantic fireworks - right in time for the 2:1 victory of our 1.FC Magdeburg - remain this day unforgettable for all of us. Instead of gifts, we asked for donations for the Magdeburger Tafel. With your help we collected an amount of more than 3000,- €. This money will allow us to implement a project idea, where we plan to give pleasure selectively to indigent children! We′ll tell you more later. Our ROTrunners have the starting number 368. At invitation by the city administration of Seoul our Managing Director Gunnar Hennings held a speech last week on the local "International block paving forum" in front of more than 200 Korean specialists! Topic: Characteristics of soils, structure of bearing layers and verification of the bearing capacity. Parallel to this our Korean sales partner presented the dynamic plate load tester HMP LFGpro at the accompanying exhibition. The fast, cost-effective test method was enthusiastically received. Together with our slovenien partner CELAB we will present you the Static Plate Load Tester HMP PDG and the Light Weight Deflectometer HMP LFG. The Static Plate Load Tester HMP PDG applies in earthworks and foundation engineering as well as road construction. It enables easily to determine the load capacity and the deformability of soils by evaluating load settlement lines and dynamic modulus of deformation of soil. The HMP LFG enables the fast and simple determination of the soil bearing capacity and compaction quality of soils, non-cohesive subbases, as well as for soil improvement applications. Being easy to handle and providing immediate measuring results, the HMP LFG is especially suited for monitoring intra-company operations. planning, designing and constructing of roads and tunnels. Dynamic plate load tests are also performed in Guatemala in order to measure quickly the compaction quality as well as the bearing capacity of the foundation material. Here it is tested, if the filled ground of the bridge bearing is really safe. Guatemala is the most populous state in Central America in the south of the Yucatan peninsula. All important cities are connected by paved roads. From approximately 15.000 km long road network, altogether only 30 percent are paved! In October 2007 the last train rode. Since then, all shipments are handled by trucks or buses and an expansion of the road network more urgently pushed. Students at the University of Applied Sciences in Magdeburg eagerly took advantage of the offer from their professor, not only to get to know the static and dynamic plate load tests theoretically, but even to test it themselves - for the aha-effect! During the training by means of our specialists Mr. Leue and Mr. Kanter many questions could be answered and so the test procedure and evaluation possibilities internalized. We are very pleased, because the students of today are the construction engineers and architects of tomorrow - quality always pays off! Symposium in Indonesia - huge interest in HMP LFG! At the accompanying exhibition for the symposium of Geotechnical Engineering for Future Infrastructure Development the invited industry experts were informed in detail about the dynamic plate load test by means of the Light Weight Deflectometer HMP LFG. Our local partner with whom we already work together now for 7 years, was glad about this huge interest. It shows once more that the test method becomes more and more popular. The simple measuring procedure, immediate measurement results and as a consequence savings in time and money convince even construction experts all over the world! Many Static and Dynamic Plate Load Tester from HMP are already in use on Azerbaijan construction sites. Today another 2 Static and 1 Dynamic Plate Load Tester will be dispatched! "What is so special about the test equipment from HMP? It just works!" - means our local partner ... and smiles. The Azerbaijan economy is growing very fast. This is based on a large extent of the expanding petrol industry, which is the most important economic sector there. The further development of the different sectors is the country’s main economic challenge. That’s why the Azerbaijan state revenues are mostly used in order to optimize the infrastructure. The main focus of investments is on water supply, sewerage and transportation, especially supported by developing the road network. Until 2015 several thousand kilometres of roads will be constructed in order to improve the connection between the particular regions. In order to accelerate the construction projects and for their quality assurance test methods from Germany are being increasingly used, such as static and dynamic plate load tests by means of the HMP PDG and HMP LFG. Our HMP christmas tree is already in place and welcomes you in our entrance area - warm and comfortable. This year decorated by Andreas Gronke, our specialist for service and packing. Much pleasure and enjoyment for the pre-Christmas period wishes you the entire HMP team! Tomorrow 10 more dynamic and static plate load tester HMP LFG and HMP PDG will leave our warehouse in direction to Ethiopia. This test equipment is urgently needed in order to push forward quickly the expansion of the railway line between Djibouti and Addis Ababa (so far the only railway line in Ethiopia). It was only in April when 30 devices were requested, in order to meet the ambitious target of the Ethiopian Railway Corporation (ERC) on time. On the whole a total of 5000 kilometres of new railway lines shall be constructed. According to the national five-year-plan for the period from 2010 to 2015: at first 2395 kilometres of new railway lines have to be constructed in order to combine 49 towns. We are glad to be part of such an important project. This really also surprised us! We received this picture from an end user in Great Britain. In this case a hole was cut into the roadway, in order to measure the bearing capacity of the underlying subbase. 1. FC Magdeburg - amazing football match against Bayer Leverkusen! It might be that you have problems in understanding us on the phone today, because we cheered our 1. FC Magdeburg yesterday. After an incredibly exciting match we unfortunately lost the second-round DFB Cup match against Bayer Leverkusen with 6: 7 on penalties - just sooo close! On the upcoming long weekend we will recover. That is what we wish you as well - regardless whether you celebrate Reformation Day, All Saints Day or Halloween! At the Iberoamerican Erosion control Congress held in Guatemala last week our partners presented the Light Weight Deflectometer HMP LFG and its application. Many meetings were held with interested professionals from the Central American region. Thank you Sergio for this picture! In order to measure the equal compaction along the entire section of the pipeline construction project in Batangas City on the Philippines, Light Weight Deflectometers are used for dynamic plate load tests. Here you can see it in use on the trench bottom at a depth of 5 m.
Many thanks Ronaldo for this picture! Batangas City is the capital of the Philippine Province Batangas. There is a large seaport and it is an important transshipment and further processing centre for agricultural products from the region. Visit us on the GalaBau 2014 in Nuremberg. We present our actual measuring equipment and look forward to meeting you personally. Get your free ticket now. We reserved tickets for you! ... and we are in the midst of it! Already for the fourth time the city centre of Magdeburg turned into a medieval metropolis last weekend. visitors on a time travel to the Magdeburg during the lifetime of the Roman-German emperor Otto I. We love our town and its history! That's why we of course support this event as a sponsor also this year. We will also exhibit on the Nordbau 2014 - the most significant building trade fair in the north of Germany - together with our partners. We will present to you our latest generation of Light Weight Deflectometers HMP LFG and look forward to your questions and suggestions. Many Static and Dynamic Plate Load Testers from HMP are already in use on construction sites in Algeria. Today 10 new Static Plate Load Testers go on the journey! Algeria is the second largest country in Africa and currently benefits from an economic boom. This was the reason for the North Africans to invest in the development of their infrastructure. The largest project is the "Transmaghrébine", a highway of more than 1200 km length, an almost complete 3-lane route parallel to the Mediterranean coast. It is the Algerian part of a North African traffic artery, which will connect Morocco, Algeria, Tunisia and Libya. Prof. Dr. Dallshad Khidhir Bzeni from the Technical University of Salahaddin in Iraq is delighted about the nondestructive and most notably fast way load tests are done with test equipment made by HMP. He is convinced that the Dynamic and the Static Plate Load Test will soon become standard in Iraq. Conventionally used laboratory procedures, like the the stamping cylinder, are very time-consuming and because of their low quantity they only have a spot-check character. By means of a rapid test method in situ, within a very short time a lot of tests can be made. Extensive correlations ensure the comparability with the laboratory procedures. For our customers and interested building experts in Turkey and around the Bosporus, we exhibited in April at the 14th Fair of Concrete and Construction Technology in Ankara. Sometimes pictures, videos and animations are not enough. Touching and testing is just better! Our expert team on site was happy to answer all the questions about function, applications and benefits of the Dynamic Plate Load Test with the HMP LFG. For sure we are also in your area - with our local distributor or at trade shows. We like to inform you about local contacts and corresponding events. Please use our contact form for your inquiry. No matter where, at the GEOTEK open house presentation in Ballenstedt, at the DITEC in-house exhibition in Haiger or the international fair AUTOSTRADA in Poland - we like to talk to you - our customers! "Thank you for the overwhelming interest in our products and test methods and the plenty of technically very interesting conversations I had only last week. You are the experts! Only with your suggestions we can optimally adjust our testing equipment to your requirements." See you at AUTOSTRADA-POLSKA, Targi Kielce 14-16th Mai 2014! We are there for you and present our latest testing equipment together with our partner GEOLAB. GEOLAB is the leading supplier of geotechnical and soil testing equipment in Poland and also delivers a wide range of laboratory testing equipment for aggregates, asphalt, bitumen and concrete. AUTOSTRADA-POLSKA expo – almost 20 years of experience, a meeting place for the business sector leaders. Facts and figures – the 20th International Fair of Road Construction Industry brings together about 1,000 companies from all corners of the world, the exhibition is held on 30,000 square meters and attended by 20,000 visitors – professionals, business people, investors and contractors. Both hands free - with the HMP LFG! You want to check the compression on many measuring points on after another? With the settlement measuring instrument on his wrist he has both hands free to do the measurement and then to go with his Light Weight Deflectometer to the next measurement point. After nearly two years of work the place was opened officially yesterday. "With the redesign of the Magdeburg Cathedral Square we have breathed new life to this venerable place," said Mayor Lutz Trümper during the opening ceremony. In order that this beautiful sight is not clouded, the executing construction companies did not renounce on quality assurance measures. For this reason the executing company STRABAG examined the bearing capacity of the substructure by using the dynamic light weight deflectometer HMP LFGpro, for preparation of the paving construction work on the Cathedral Square. A total of 30 Light Weight Deflectometers HMP LFG and additionally 8 Static Plate Load Testers HMP PDG left our storage for being sent towards Ethiopia! The test equipment was urgently needed for the speedy extension of the rail road between Djibouti and Addis Adeba - so far the only railway line in Ethiopia. In September 2010 the Ethiopian Railway Corporation (ERC) announced its plans to build in total 5000 kilometers of new railway lines. The national five-year plan for the period between 2010-2015 schedules to build first 2395 km of the new rail road, which shall connect 49 cities. Ethiopia is currently one of the world's fastest growing economies. By 2020 the country wants to be a "middle-income" country. In particular China is supporting Ethiopia with their railway construction. The main route will be the old connection to Djibouti. Via the port of Djibouti Ethiopia is proceesing 90 per cent of its goods import and export. Railway transport is cheaper and far less susceptible than Ethiopia's jammed streets, which are not rarely flooded in the rainy season. First HMP LFG – in use for 22 years! The first HMP LFG was sold according to new Engineering Code in October 1992 and still works properly – after almost 22 years of continuous operation! Mr. Christian Recklies (engineer at the “PGI Planungsbüro Geohydrologie, Grund- und Ingenieurbau GmbH, Magdeburg) just received it here recently cleaned and calibrated. That’s the advantage of a calibration directly at the manufacturer - certified by the Federal Highway Research Institute (BASt). We do know all of our device generations in detail, clean the devices properly, carry out necessary repairs and upgrate the electronics by means of a firmware update. Our “high-quality care” guarantees you also a safe use of your tester many years to come! Ukrainian Railways trust on HMP! Our Light Weight Deflectometer has been of fundamental importance for the trouble-free train operations in the host country of the European Championship 2012. The Ukrainian southern railway has planned the expansion of the transport corridor on time. For the first time a 13-ton virbation roller and a HMP LFGpro for internal quality assurance & fast review of achieved compaction were used. Several rail sections were reconstructed, straightened and newly filled. The result speaks for itself - the new Express-Railway sections were completed one month earlier than planned! With a cordial "Buenos Dias!" we welcome our users in Panama! Currently the HMP LFGpro is used for the extension of the container port Manzanillo International Terminal. The possibilities for further applications are immense, in total more than 11400 km roads shall be reconstructed in Panama. Ideal conditions to secure a quick and cost-effective quality assurance by means of the Light Weight Deflectometer. The Spanish intuitive menu navigation allows also even inexperienced users immediate error-free measurements. The Light Weight Deflectometer HMP LFG corresponds to the ASTM E2835-11 Standard Test Method for Measuring Deflections using a Portable Impulse Plate Load Test Device. Due to tradition construction quality is a top priority for Kern-Haus. HMP LFGpro - now on Papua New Guinea! Our testers are already being used in more than 80 countries, but even though we were surprised about this order. Papua New Guinea is also for us an exotic shipping address! Recommended by our South African partner, ordered by an Israeli construction company and delivered to this Pacific Island State, our HMP LFGpro will now be used there for quality control when constructing new roads. Hard work pays off - this slogan can also be confirmed by our freshly examined Bachelor of Business Mrs. Bluszis. On the occasion of her good degree company founder Klaus Hennings personally insists on congratulating her in person with a bouquet of flowers. Her study at the chamber of commerce and industry (IHK) Magdeburg, which was financed by HMP, was a real challenge for Mrs. Bluszis, because she had to balance her job and family despite of the exam stress. Accordingly great is the pleasure for HMP, that Mrs. Bluszis can now increase her engagement in the company due to her additional qualifications. We also support our users overseas! The sun was shining when our Korean distributor visited us for being teached in the handling of the Light Weight Deflectometer and the Static Plate Load Tester. As a global acting company we are counting on competent sales partners, that is why we are always offering training for our complete range of products to assist all users on site in best possible way. HMP supports the stars of tomorrow! We were there right from the start and are still inspired! What a weekend! The 1. FC Magdeburg received Germany’s up-and-coming elite for the 13. Matthias-Pape-commemoration-tourney. A total of 20 teams from the U15-age-group were united by the FCM under the roof of the venerable Hermann-Gieseler-Sports-Hall, looking for the successor of last year winner VfL Bochum. With this tourney the Magdeburger soccer club reminds of the juniors trainer Matthias Pape, who died in 2001 and with whom the A-Juniors won the DFB-Cup in 1999. It was a great tourney. Fortuna Düsseldorf beat off the challenge against the players of VfL Wolfsburg and won the tourney. We can comfort ourselves, that we lost in the quarter finals against the winners. "I am one of the lucky ones who can enjoy every day, because I am healthy and have family and friends. Today I want to share my happiness, because like Albert Schweitzer already said: "Happiness is the only thing that doubles, when you share it." I have everything I need. On the occasion of my 65th birthday I was glad to receive flowers and donations for the children's hospice Magdeburg. I am very happy to personally hand over this gift in amount of 2.000, - € today and I hope so much, that the days for theses children can be made even sunnier and more colorful." The donated money is used to accompany the families and siblings of the seriously ill children and youngsters. Yesterday the Entrepreneur Award of the Ostdeutschen Sparkassenverband was presented! We have convinced them and received the award "Entrepreneur of the Year" for Saxony-Anhalt. (left to right): Mr. Jens Eckhardt (Board Member of Sparkasse MD), Klaus and Gunnar Hennings (HMP GmbH), Dr. Michael Ermrich (Executive President of OSV). The desired Award was already granted in 2013 for the 17th time. We were nominated by the Department of Economic Affairs, Tourism and Regional Cooperation of the state capital Magdeburg. Thank you! Our special thanks is due to our committed employees, long-time distribution partners, suppliers and business partners. Without them this huge success would not have been possible! It is searched for companies that stand out through innovation, creativity and commitment to the region. See you at "Infrastructure" Warsaw 22-24th October 2013! For ten years, the International Trade Fair of Municipal and Road Infrastructure has been one of the most important and the most comprehensive events in Poland dedicated to this subject-matter. 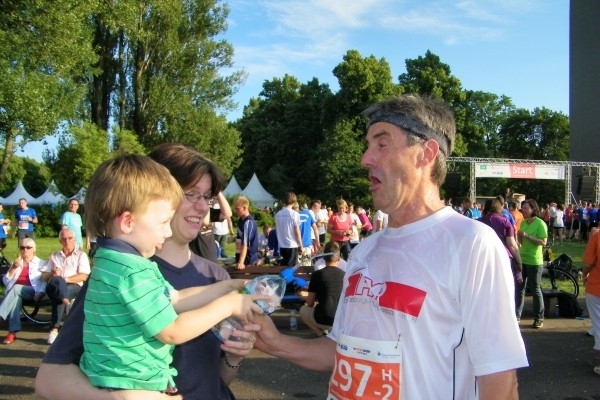 Yesterday at 06:00 pm the start gun sounded for the fifth edition of the company relay in our home town Magdeburg. 5 x 2.5 km was the distance around the Adolf-Mittag-Lake, directly in the heart of Magdeburg. The company relay is THE sporty event of the year and the biggest networking possibility of the region. Each team consists of 5 runners. Here you can see our finish. We are the team with the starting number 317! The first three runners have finished! NordBau - the latest from the building branch! NordBau Neumünster has become the most significant building trade fair in the north of Germany and, therefore, a trend-setter for the entire German building trade. The latest from the building branch, up-to-date information about building, products and services. Since 1956 NordBau has offered a platform for trade visitors as well as interested parties from public and private sectors. Try out there our new development - the Light Weight Deflectometer HMP LFGpro - unbeatably easy to use, small, portable and precise. HINT - If you don't time for a visit at the fair, you can now also simulate the Plate Load Test with the HMP LFGpro online. Emperor Otto Festival in Magdeburg! Last weekend Emperor Otto the Great and his second wife Adelheid again ruled Magdeburg for three days. More than 1.000 participants were involved. Knights, jugglers, minstrels, minnesingers, jestens and many other performers took us with them on a journey back to Middle Ages. Magdeburg is more than 1200 years old. Many famous celebrities have left their mark. (Almost) every inhabitant of Magdeburg remembers two historic figures: Otto the Great - Roman-German emperor. And Otto von Guericke - councillor and scientist. Magdeburg belongs to the medieval metropolises of the Holy Roman Empire. The name was mentioned for the first time within the Diedenhofener Kapitular, issued by Charlemagne in 805. A good 150 years later the initial Boom was registered for this place: emperor Otto the Great made Magdeburg to an archbishopric in 968. We are proud of our town! That's why we do support this project. HMP nominated for Entrepreneur Award! The HMP GmbH was nominated for the Entrepreneur Award of the Ostdeutschen Sparkassenverband. The desired Award is granted for the 17th time in 2013. This year we were nominated for the category "Entrepreneur of the Year" and have already reached the final. We were proposed by the Department of Economic Affairs, Tourism and Regional Cooperation of the state capital Magdeburg. Thank you! Firstly we would like to say thank you to all the institutions and companies, which recognized our performance and nominated us for those award. The award “Große Preis des Mittelstandes“, issued by the Oskar-Patzel-Foundation, is the mostly preferred economy award in whole Germany. Feeling responsible for its own region is one of the categories the contest pays attention to. Turnover and profit are important as well, furthermore the number of jobs and apprenticeship training positions, the capability to be innovative or the marketing concept. Up to now we reached top marks in all categories. We were already awarded as finalist in 2010. Maybe we are able to grab for the “Große Preis“ this year. Phew - all Sandbags are emtied again, in- and outflows opened, technology connected and furniture moved, electricity and phone switched on - we survived the flood unscathed and we are back for you as usual! Many thanks to all volunteers, but also to all our customers and business partners for their participation, support and patience! Attention! Due to the actual flood situation in our area we had to take some preventive measures and are only limited capable of acting. Right now you can reach us only by the following email info@hmp-online.de or by our contact form, because our telephone and electrical connections are interrupted. We are highly engaged to answer all emails short-term. Flood situation is ebbing continuously here and that is why we are promising, that we are fully operational again latest on Thursday. Because of the taken preventive measures all testing equipment, currently located in our workshop for service, are safe and dry! All new orders for testing equipment can be delivered without delay. THANK YOU VERY MUCH to the thousands of volunteers, who have saved Magdeburg from an even greater disaster! HMP GmbH was honored by the city of Magdeburg again! We are actively committed to creating and preserving jobs and safeguarding of skilled employees in Magdeburg. It's a matter of course for us. All the more we are pleased about the public recognition of our commitment and the award by our mayor! The international standards organization ASTM International, headquartered in the US, has officially accepted the test method for measuring deflections using a Light Weight Deflectometer as an international standard test method under the registration number ASTM E2835-11. The ASTM standards are comparable to the German DIN-Norm and are mandatory, when conducting public works in America. The approval of the ASTM to execute tests with the Light Weight Deflectometer results in increased application of the dynamic plate load test, not only in America but in many countries of the world which use US-American standards for construction. Klaus Hennings – awarded as Entrepreneur of the Year 2012! “The Entrepreneur Award 2012 shall honor companies that are regionally and locally rooted, socially sustainable and economically successful. Special emphasis is placed on the creation and retention of jobs and the sustainable use of resources”, the spokesmen of the selection committee Mr. Gert Hohlwein pointed out. “This is our company philosophy! We are producing here in Magdeburg for 30 years and rely on regional suppliers and employees, because we want to continue being a reliable partner for our customers, employees and business partners. As family-owned business it is important for us to operate sustainably. Thanks for the recognition. It shows once again that we are on the right track.” Klaus Hennings, Managing Director. Representing the company founder Klaus Hennings, his son Gunnar Hennings received the award. Do you already measure the bearing capacity according to the current state of the art? In case you are not, we can raise you to this new standard and your measuring device as well. Take advantage of the most modern measuring technology now! The measuring device HMP PDGpro is compatible to all common plate load devices and can be retrofitted without problems. At a glance you have all measuring data, target values and settlement curves on the extra large, nondazzling graphic display. You are guided comfortably through the menu. Anyhow the measuring device is manageable, small and comes with USB, GPS and printer interface. Feel free to print the measuring data directly on site or create professional inspection protocols on your PC. You even wish to test the measuring device? No problem! Please try the animation of the static plate load tester. Perform measurements interactively and get acquainted with the application. Get consulted individually. Please contact us under +49 (391) 2514666 or use our online contact form. We are pleased to send you a nonbinding offer and more detailed information. Precision is our passion! You can count on our more than 30 years lasting experience in the production of test equipment, with our own development and most modern manufacturing , certified according to EN ISO DIN EN ISO 9001:2008. HMP is a authorized calibration institute the Federal Highway Research Institute. Our qualified team and the independent service department are guaranteeing competent consulting and reliable service. Let us inspire you! There is nothing like personal contact! According to this principle the ambassador of India, Mrs. Sujatha Singh, recently met with entrepreneurs from Magdeburg for an exchange of information and for introducing projects how to support the German-Indian cooperation. Only a few companies from the regional chamber of the CCI actually have business contacts to India, among these there are four companies from Magdeburg - also the HMP Magdeburger Prüfgerätebau GmbH. The CCI Magdeburg invited their representatives for having a dinner with the ambassador. Within this atmosphere new ideas for cooperation sprout and cultural characteristics of the young, modern India were exchanged. The HMP Magdeburger Prüfgerätebau GmbH is in close contact with distribution partners and users in India, because devices like the Light Weight Deflectometer HMP LFG and the Static Plate Load Testers HMP PDG for compaction control and bearing capacity are also in use there for road construction, civil engineering and railway construction. "Magdeburg is not part of our company name in vain. We are inspired by the city as economic, educational and living environment. Many of our international partners are surprised by the manifold architecture, the green city and the friendliness. We are engaged in the "Pro Magdeburg" e.V. to strengthen the positive image of our city and make it known across the borders. " In Magdeburg there are more than 12,000 companies. 40 of them were now honored in particular at the town hall. At the reception the mayor of Magdeburg, Dr. Lutz Trümper, dignified that the invited owners/CEO’s of the winning companies: "You personally and your company contributed to the fact, that over 100,000 jobs have been created in Magdeburg. You made market economical pioneer work in Magdeburg, you are standing at the top of a company that accomplished on the market despite 20 years of structural changes and economic crises." With a certificate and a stele he expressed his gratitude for the successful entrepreneurial activity for the city on the river Elbe. “The criteria for the award include success on the world market, export activities and exemplary social efforts." underlined the deputy mayor for economic affairs Rainer Nitzsche. Our senior managing director Klaus Hennings proudly received his award - well deserved! Even have a look on it and download it or let us send you a paper version >> just give us a call under +49 391 2514666. Now with new design, detailed information about the Dynamic Plate Load Test and the compaction control by using the Light Drop-Weight Tester HMP LFGpro. Carrying out the test is easier now. The result is available within only 2 minutes. Due to the USB port data can safely be transferred for further processing. Just try it - directly with our online animation or rent one of our trial devices. The competition "Medium-Sized Business Prize" was awarded on Saturday in Magdeburg to twelve successful entrepeneurs. The prize winners of this German-wide Award are companies from Berlin, Brandenburg, Mecklenburg-Vorpommern, Saxony and Saxony-Anhalt. Nominated were more than 3500 companies. This prize is non-monetary and recognized throughout Germany as the most popular business award. The Oskar-Patzelt-Stiftung as the donor of this award wants to point out the especial achievements of the mid-sized businesses for the economy. Awarded were now companies, which created jobs and training positions or which offered a special service. Also innovation and regional commitment were recognised. The HMP GmbH was awarded as one of the 6 finalists from the German state Saxony-Anhalt. NordBau Neumünster has become the most significant building trade fair in the north of Germany and, therefore, a trend-setter for the entire German building trade. The latest from the building branch, up-to-date information about building, products and services. Since 1956 NordBau has offered a platform for trade visitors as well as interested parties from public and private sectors. Try out there our new development - the Light Drop-Weight Tester HMP LFGpro - unbeatably easy to use, small, portable and precise. HINT - If you don't time for a visit at the fair, you can now also simulate the Plate Load Test with the HMP LFGpro online. Celebrate with us! On July, 24th in 1990 the HMP GmbH was established by Mr. Klaus Hennings. Now this company is market leader of its branch and customers world wide trust in the precision and reliability of the testing equipment from Magdeburg. HMP LFGpro - Presentation at the bauma2010! The new evaluation unit for the Light Drop-Weight Tester HMP LFG - now handling becomes even more easy. It's small, portable and precise, with an extra large illuminated display and USB interface for fast data transfer. So don't hesitate to download and look at the new brochure. Visit us at the bauma2010 from 19 - 25 April 2010 in Munich! The bauma is by far the largest and certainly the most impressive trade fair for construction machinery, building material machines and construction equipment ever. No other trade fair of this branch features a wider range of products and services and no other trade fair is more international. We will be there for you with our experts and present our recent developments and traditional tester for soil mechanics and answer your questions. Make use of this information advantage. We look forward to welcome you personally at our stand 128 in hall B3. HMP is winner of Work-Life-Balance-Contest! The HMP GmbH received a price from the regional capital Magdeburg and the town marketing “Pro Magdeburg e.V.” for being an especially family friendly and innovative company. This reflects the company philosophy of the management, because only employees, who like to work in the company, can achieve maximum output, develop and manufacture tester of highest quality and precision. HMP devices are in continuous action all over the world and indestructible. On that we are sure. In order that you and your customers can also be it, we provide you a 2-year-guarantee, of course for free. 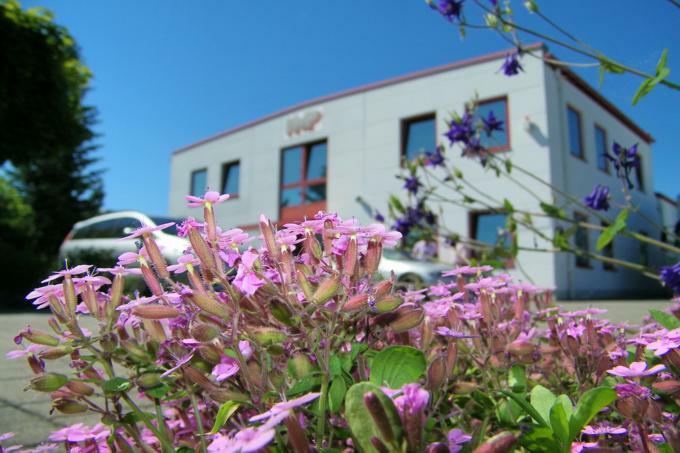 The managing director Klaus and Gunnar Hennings were deeply stirred, when each employee congratulated them with a red, the company's logo color, flower. Many things changed within the last years. The long-established company has specialized in new and further development of testing equipment for road construction, civil and underground engineering and railway construction and belongs now to the European market leader of the branch. The quantity of employees increased threefold and satisfied customers in more than 70 countries worldwide speak for itself.